The painting was lithographed by Alexandre IV Moitte and included in Monuments des arts du dessin . . . recueilis par le Bon Vivant Denon (Paris: 1829), 4: pl. 300. Paris, collection of Charles François Silvestre (1667-1738; painter). By descent to his grandson, Jacques Augustin de Silvestre. Paris, collection of Jacques-Augustin de Silvestre (1719-1809). 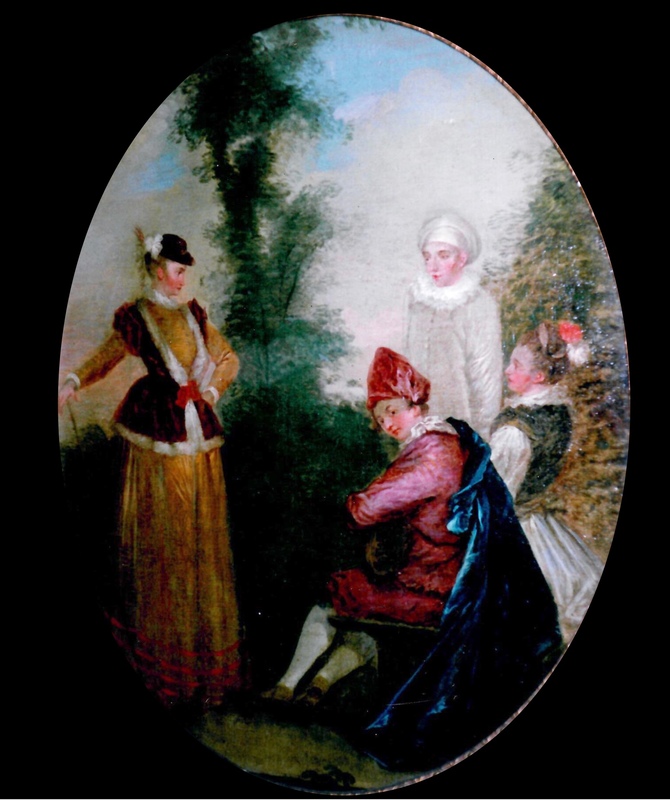 His sale, Paris, March 25, 1811, lot 79: “WATTEAU (Antoine) . . . Deux Tableaux, Dans l'un, une jeune Dame debout écoute un cavalier qui pince de la guitare; un homme habillé en pierrot et une jeune fille sont assis près de lui. Dans l'autre, un Homme pinçant de la guitare près de deux dames assises et d'un homme habillé en mezzetin. Des bosquets terminent les fonds de ces compositions. / H.6.p.10l., L.9p.6l. C / Un dessin fin et correct, une couleur vigourese et transparent, et une touche spirituelle, sont les qualités qu'on admire dans ces deux ouvrages de Watteau.” According to an annotated copy of the catalogue in the London National Gallery, it was bought for 440 francs by a “Mr.  L.” The Getty Provenance Index identifies the buyer as Lavallée fils. Baron Denon Dominique Vivant, (1747-1825; Directeur Général des Musées Impériaux). His sale, Paris, May 1-9, 1826, lot 188: “Deux tableaux d'un pinceau trés fin. Ils représentent des réunions Inventory and Valuation […] of Nos 10 and 20 Lansdown Crescent Bath, The Tower, on Lansdown and Farm and Premises all adjoining – the property of the late William Thomas Beckford Esqr[…], Sept 13th 1844, Edmund English & Sons, Bath, and Robert Hume, London, 1844 (Bodleian Library, Oxford, MS. Beckford c. 58, p. 12), as 'A Pair – Garden Scenes with Figures in Conversation' by 'Watteau'; List of pictures, Furniture, Ornaments, China & c. sent from Bath to Easton Park, 1848-1849 (NRAS 332/M/12/50, p. 2), as ‘Sent to Easton Novr 1849 / A Pair – Garden Scenes / Watteau; Easton Park, Suffolk. A True and Perfect Inventory and Appraisement of All and singular the Household Furniture, Plate, Linen, China, Books, Prints, Pictures, Jewels, Trinkets, Wine and other the Personal Effects of The Most Noble His Grace The Duke of Hamilton K.G. (at the Mansion at Easton Park in the County of Suffolk in the Diocese of Norwich) who died on the 18th day of August 1852. Taken and made on the 13th and following days of September then next ensuring By Robert Cana and William Cana, Appraisers (NRAS 332/M/12/52, vol. 2, pp. 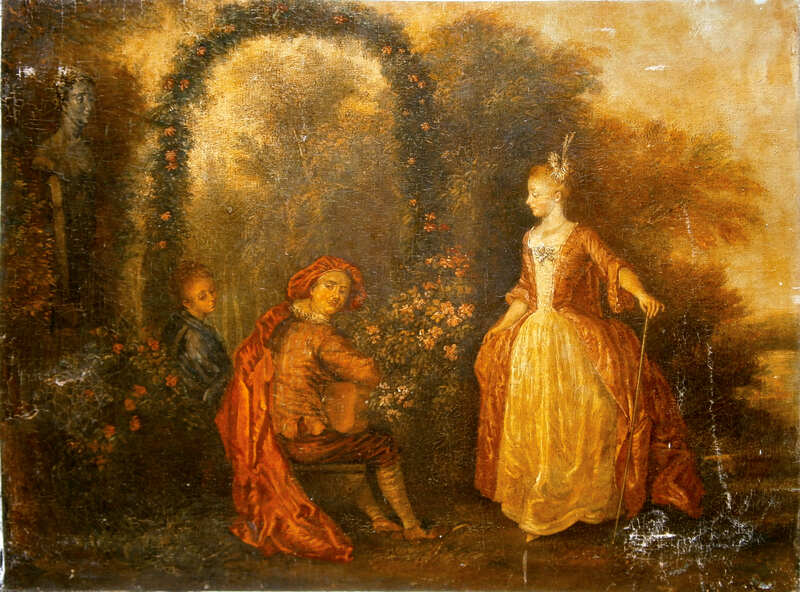 17, 18), as ‘Garden Scene / Watteau'; jeunes dames viennent de quitter leur domino, elles sont assises près des corbeilles de fleurs; un des cavaliers joue de la guitare. Dans l'autre, une jeune femme dèguisée en bergère galante, est debout près de trois personnages aussi en habits de caractère et groupées dans la demi-teinte; une d'elles joue de la guitare. Des ifs, des jets d'eau, des allées d'arbres et des bosquets, donnent l'idée des jardins les plus agréables et accompagnent parfaitement les figures. L'un est lithographié. / L. 10 pounces - H. 7 pounces. C.” The two pictures were purchased by Gregorio Franchi for 3015 francs. Paris, collection of Simon Jacques Rochard (1788-1892; miniature painter), about 1830. Bath, collection of William Thomas Beckford (1760-1844). His ownership is attested to by an 1844 inventory: “Inventory and Valuation . . . of Nos 10 and 20 Lansdown Crescent Bath,” Oxford, Bodleian Library, MS. Beckford c. 58, p. 12: “A Pair – Garden Scenes with Figures in Conversation” by “Watteau.” His sale, Bath, July 24ff, 1848 (third day), lot 33: “Watteau / A Pair – Garden Scenes, with Conversation and Musical Parties. Two precious and valuable Specimens of the Master, richly coloured, and very highly finished. Copper, 7 ½ inches by 10 ¼ inches.” The pictures were apparently bought in or withdrawn. Collection of Susan Euphemia Beckford, Duchess of Hamilton (d. 1859; wife of Alexander, 10th Duke of Hamilton). By descent to her grandson William, 12th Duke of Hamilton (d. 1895). Under the terms of a trust fixed in 1893, the paintings passed to his daughter, Mary Louise Douglas-Hamilton, later Duchess of Montrose. London, Royal Academy, Landscape in French Art (1949), cat. 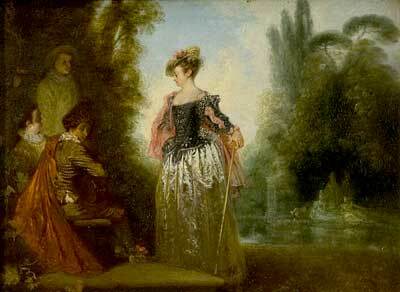 88 (by Watteau, The Adventuress, lent by the Trustees of the twelfth Duke of Hamilton). Manchester, Art Treasures Centenary (1957), cat. 172 (by Watteau, The Adventuress, lent by The Duke of Hamilton’s Trust: Arran and Easton Trustees). Washington, Paris, Berlin, Watteau 1684-1721 (1984), cat. 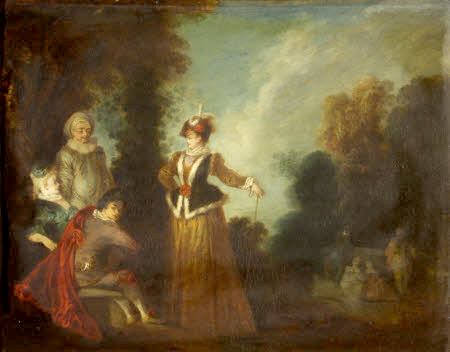 20 (by Watteau, The Adventuress [L’Aventurière], lent by Brodick Castle, National Trust of Scotland). New York, Metropolitan Museum, Watteau, Music, and Theater (2009), cat. 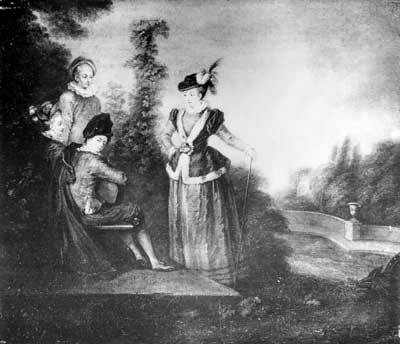 6 (by Watteau, The Adventuress [L’Avanturière], lent by Brodick Castle, National Trust for Scotland). Amaury-Duval, Monuments des arts du dessin (1829), 4: n.p. Goncourt, Watteau (1875), cat. 109. Dacier, Vuaflart, and Hérold, Jullienne et les graveurs de Watteau (1921-29), 1: 199, 3: cat. 11, p. 137. Réau, Watteau (1928), under cat. 103. Adhémar, Watteau (1950), 146 note 8, under cat. 124. Watson, “Watteau, Peintre Inconnu” (1962), 126. Aix, La Passion selon Don Juan (1991), under cat. 121-22. Rosenberg and Prat, Watteau, catalogue raisonné des dessins (1996), cat. 484, 609. Temperini, Watteau (2002), cat. 27. Brussels, Palais des beaux-arts, Watteau, Leçon de musique (2013), under cat. 39. 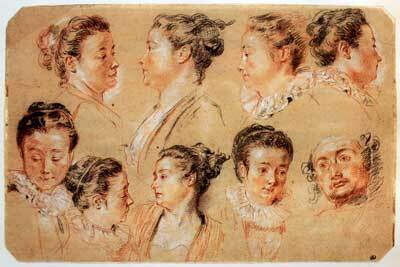 Watteau, Studies of a Woman’s Head and a Man’s, red, black and white chalk, 25.1 x 38 cm. Paris, Musée du Louvre, Département des arts graphiques. Unidentified artist, L’Avanturière (detail), Brodick Castle. Normally, one does not need to speak of drawings related to copies of Watteau’s compositions, since the copies are based on the painting or a print after the composition. In this instance, curiously, the copyist has relied on a Watteau drawing now in the Louvre (Rosenberg and Prat 484). Grasselli, Rosenberg, and Prat have pointed out that the head of the seated woman in the Brodick Castle painting was based upon the head of the woman in the bottom row, second from the left. Also, the head of the adventuress was based on the study second from the left in the top row of the drawing. While the close relationship between the painting and drawing would be normal if the copyist were Watteau, we do not believe this is the case here. This problem is discussed below in greater detail. This version of L’Avanturière and its pendant L’Enchanteur were rarely cited in the Watteau literature of the late nineteenth and early twentieth centuries. Although they were thought to be by Watteau by the Hamilton family and were listed under his name in their various inventories and evaluations drawn up during those decades, Watteau scholars did not know the paintings firsthand. At best they were remembered through the Sylvestre and Denon catalogues, but were viewed as copies. Dacier, Vuaflart, and Hérold, as well as Réau, classified them as copies without having seen them and without knowing where they were. When the pair of paintings was presented at the 1949 Royal Academy of Art exhibition, they were shown together with the Troyes pictures and were presented as “attributed to” Watteau. A decade later, F. J. B. Watson pointedly wrote against them, saying that they showed “how very deceptive the best contemporary copies can be.” A turning point occurred in 1984, when the pictures were again shown in tandem with the originals from Troyes and, this time, Pierre Rosenberg presented them as autograph works. Since then the Hamilton paintings have been accepted by a number of scholars, including Bruno Ely and Catherine Camboulives in the 1991 exhibition at Aix, by Temperini in 2011, and by Florence Raymond in 2013.  Yet one should question whether this optimism is wholly justified. Rosenberg was very much swayed by the account given by Vivant Denon, and recorded in Amaury-Duval's Monuments des arts du dessin. According to Denon, Watteau had given the paintings to Charles François Sylvestre as a token of their friendship. Denon wrote, "I have a painting by him [Watteau] whose figures were drawn from his friends the Italian actors. The color of this painting is admirable; it was done as a token of friendship for his friend, Silvestre, engraver and drawing master of the Royal children: I bought it at the sale of the grandson, with its pendant, which is equally precious.” However, this account, written a century after the supposed gift was tendered is garbled at best. There was some relationship between Watteau and the Silvestre family, and Watteau based his painting La Chute d’eau on a drawing made by one of them. Something of this may lie behind the legend that Watteau gave these pendants to Charles François Silvestre. Insufficient attention has been paid to the many changes introduced in the Brodick Castle picture. In general, the artist altered details that mitigate the stiff, awkward quality of the Troyes version and aligned it more closely with Watteau’s mature style. Although the adventuress is posed in profile, her posture is not the severe type seen in early works such as the Troyes painting or L’Hiver in the Musée Carnavalet. Most interesting, Grasselli, Rosenberg, and Prat point out that the female heads in this copy are based on a Watteau drawing now in the Louvre. Nonetheless, these studies from the model are subtle and nuanced, but the same cannot be said of the heads in the Brodick Castle painting. The costumes in the Scottish version have been modified as well. 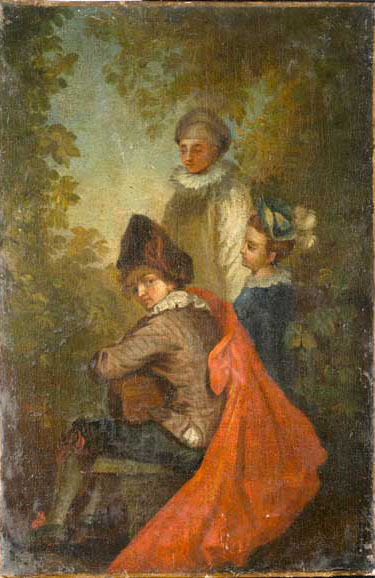 In place of the Troyes adventuress’ distinctive hat with its pert cockade (a type of accessory that Watteau favored in his early career, as in Les Jaloux), the painter of the Brodick Castle picture chose a type of straw hat that Watteau used in his later career (but only occasionally for women, as in the pilgrim alighting into the boat in the Berlin Embarquement). Even less typical of Watteau, the adventuress has a white silk skirt that glistens with undue brilliance, and she wears a small pink cape whose color is almost without parallel in Watteau’s oeuvre for a principal figure (an exception would be one of the pilgrims boarding the boat in the Île de Cythère). Most damning of all, her vest has been adorned with a design of dots and large flowers. Except for the dress worn by the girl in Iris, c’est de bonne heure, Watteau consistently eschewed all patterned fabrics other than those with simple stripes. The many qualitative differences and the oddities of costume in the Brodick Castle painting should make one wary of accepting the picture as authentic. Similar issues arise in the pendant L’Enchanteur. It seems inescapable that the two paintings are slighter later copies with significant variations. But, at the same time, the copyist's dependence on the Watteau drawing of heads in the Louvre suggests that he was within Watteau’s circle. Who was the copyist? What were the circumstances behind the painting’s creation? These are intriguing but unresolved issues. Hédouin, Mosaique (1856), cat. 21. Versions of L’Aventurière that appeared twice for sale in 1851 were undoubtedly one and the same painting. 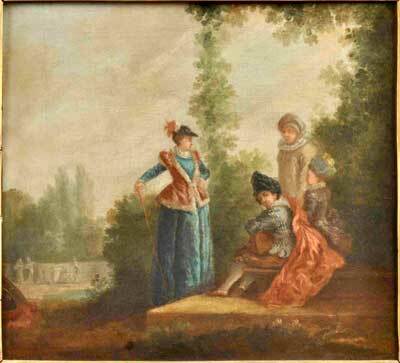 In both sales it was described as a Watteau composition that had been engraved and in the second sale its specific name was given. Lugt identified the second sale as coming from a “Stevens” collection (without a first name) but this is not stated in the sale catalogue and the accuracy of Lugt’s claim should be questioned. Certainly one should wonder if this version of L’Aventurière had been in such a collection since it had appeared just two and a half months earlier in another anonymous sale. Most probably it did not sell the first time round and was merely being reoffered in the April sale. In 1856 Hédouin described seeing what he thought was Watteau’s L’Aventurière and L’Enchanteur in La Caze’s collection. However, the two paintings he was referring to were, apparently, L’Indifférent and La Finette. This is a relatively direct copy of Watteau’s composition, yet there are some differences. The adventuress’ face is no longer in pure profile but is set in a softer, three-quarters view. Also, the figures standing against the wall in the background have been omitted. As best we can judge, some of the colors were changed: the guitarist in the Michel-Levy version has a blue rather than a red mantle. Tyntesfield, collection of George Richard Lawley Gibbs (1928-2001; 2nd Baron Wraxall). Purchased from his estate with the assistance of the National Heritage Memorial Fund, the National Art Collections Fund and donations from members and supporters, 2002. The copyist responsible for this work was not particularly gifted. On the other hand, the picture is of interest because it seems to have been executed in the eighteenth century and was based directly on Watteau’s original. It not only corresponds in direction to Watteau’s composition but also echoes Watteau’s choice of colors. Chartres, Musée des beaux-arts, inv. 5609. Chartres, collection of Justin Courtois. Donated to the Musée municipal, Chartres, in 1868. Chartres, Musée municipal, Catalogue (1931), cat. 245. This mediocre copy, apparently based on the Audran engraving, appears to be nineteenth-century in origin. This copy of L’Avanturière entered the museum’s collection in 1893. Adhémar, Watteau (1950), under cat. 124. Washington, Paris, Berlin, Watteau 1684-1721 (1984), under cat. P18. In 1984, Rosenberg referred to this copy as having once belonged to the Bailleul museum, implying that it is no longer there. New York, Christie’s, February 24-25, 2015, lot 326: “A PAIR OF LOUIS XV STYLE SHIELD-SHAPED OVER DOOR PANELS IN GILTWOOD FRAMES, AFTER FRANCOIS BOUCHER, together with a similar example / The pair 155in. (139.5cm.) high, 50 ½in. (128.5cm.) wide. Est. $3,000 - $5,000.” Sold for $625. 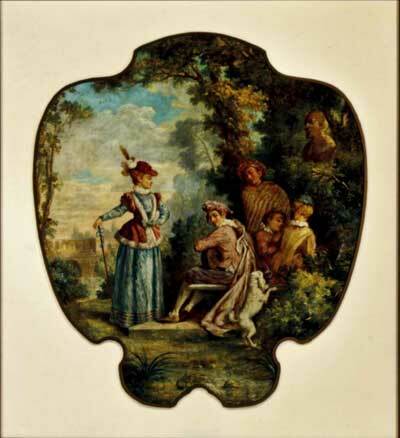 This commercial copy after Watteau, probably made in the nineteenth or twentieth century for the decorator trade, was based upon the Audran engraving. Cracow or its environs, private collection. Sold to Mr. Wiaczkis by the previous owner. This partial copy of L’Avanturière was based on the Audran engraving after Watteau’s composition. This painting is three times larger than Watteau’s, and is much more decorative in its intent. The woman’s distinctive costume has been changed into a later, more ordinary eighteenth-century gown. Watteau’s vague foliage behind the principal figures has been transformed into an elaborate arbor, and there is an overall profusion of leaves and flowers. Much of the right third of Watteau’s composition has been eliminated so as to emphasize the principal figures. Judging by the poor execution, this painting would seem to be a later century’s response to the French Rococo. Although the painting was formerly attributed to Watteau, it clearly is just a poor modern copy after the Audran engraving. The original horizontal composition was compressed into a vertical one, and tailored to an oval format. 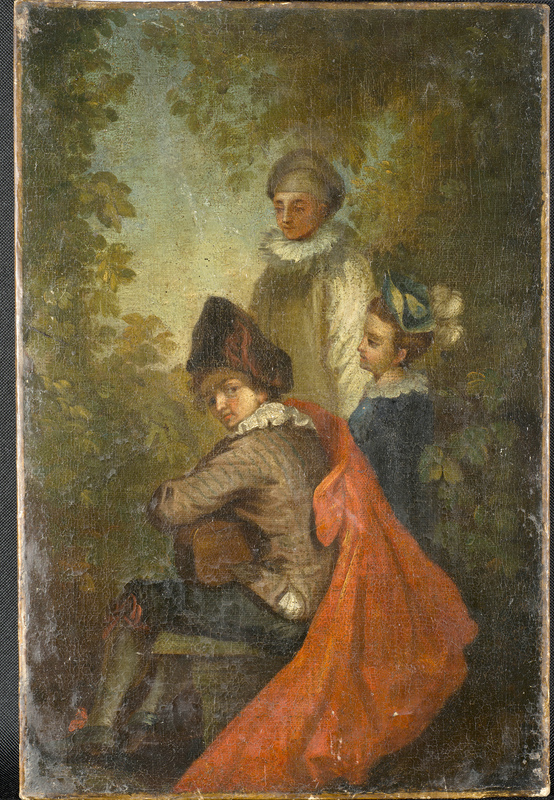 London, sale, Foster and Son, May 9, 1849, lot 53: “Watteau . . . . L’Avanturiére.” Sold for 13 guineas to Longmore. The price and buyer’s name are recorded in the annotated copy of the sale catalogue from the auction house, now in the National Art Library, Victoria and Albert Museum.